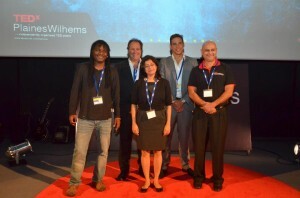 BBDO Lanka Managing DIrector Santosh Menon was one of five international and local speakers at the first ever TEDx event in Mauritius held in Mauritius on January 31. Mr Menon opened the floor with his well received talk about ‘Brand Magic’ – about brands making a positive difference in the communities they operate in and utilising creative ideas to not only create advertising ‘magic’ but also making a genuine difference in the lives of consumers, according to a media statement from BDDO. Organised under the theme of ‘Going Beyond’, the well attended event also featured other accomplished speakers of repute from a wide range of disciples. 2012 Olympic swimming champion Chad Le Clos who shared his experience of breaking down the psychological barriers to beat Michael Phelps and reach the top of the world was one of the highlights of the event. Other speakers comprised technologist Marc Israel – Office Division Lead at Microsoft Africa – who took the audience through the journey of how technology as a tool aims at augmenting basic human capabilities to take us to the next level, saxophonist Jose Therese – founder of the Mo’Zar Atelier de Musique school of professional music – who described how music can give kids from slums a future even when the education system fails, and the national South African swimming coach Graham Hill who shone a light into the unseen world of physical and psychological pain that a champion endures in his journey towards triumph, the statement added. TEDxPlainesWilhems or TEDx is a non-profit and independently organised event operated under licence from TED which is devoted to Ideas Worth Spreading. Having begun as a four-day conference in California 25 years ago, TED has grown to support those world-changing ideas with multiple initiatives. BBDO Lanka, under the helm of Mr Menon, says it’s uniquely positioned in the advertising industry having launched its Force for Good initiative in 2012 by becoming the first carbon neutral advertising agency in South Asia. Most recently the companyt teamed up with the iconic Sri Lankan Country Music Foundation concert for charity – Country Roads – which this year, in partnership with UNICEF, will renovate three high courts to be used only for the hearing of child abuse and other juvenile cases as well as provide training for judicial staff on how to properly interact with the children.